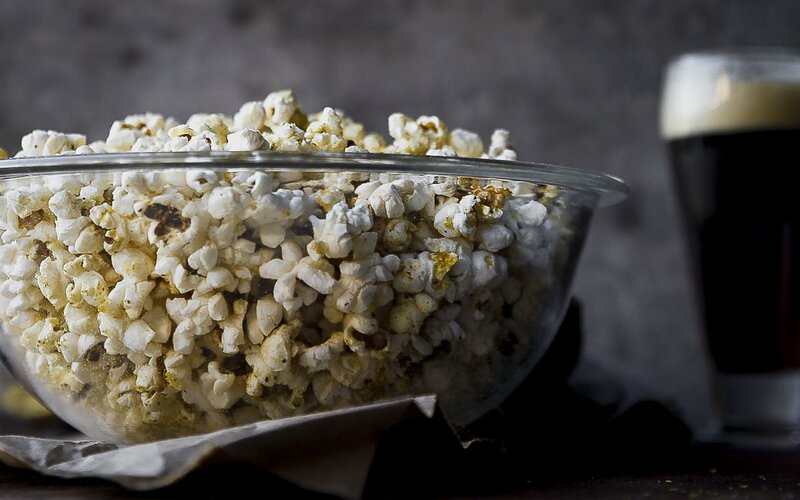 Using ghee as the cooking oil for this stovetop popcorn gives a layer of delicious buttery flavor that goes so well with crisp (not chewy) popcorn. And Nutritional Yeast is what I grew up with. 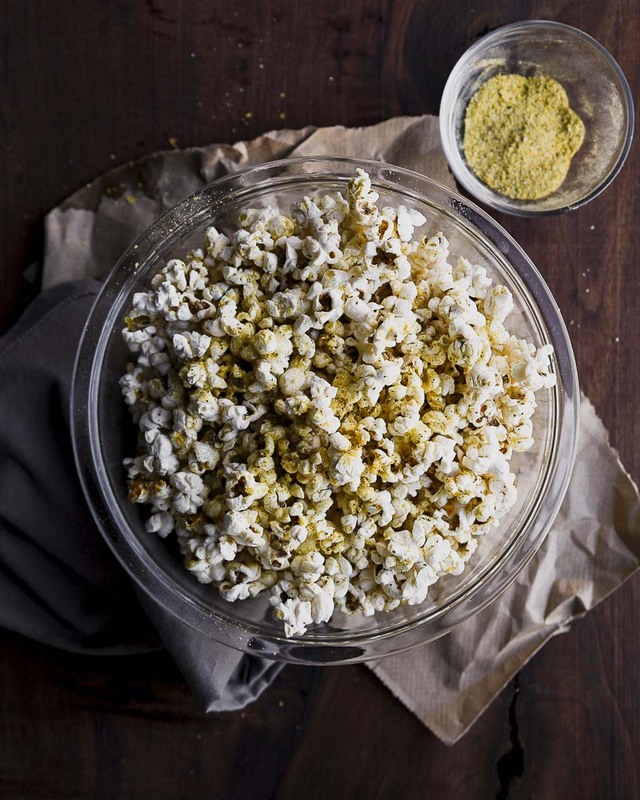 Carob and Tempeh can stay in the 70s but popcorn just doesn’t taste like popcorn to me without the cheesy flavorful tang of nutritional yeast. And bonus, mixing the nutrional yeast with the kosher (or sea) salt helps it cling without adding more butter or oil at the end. 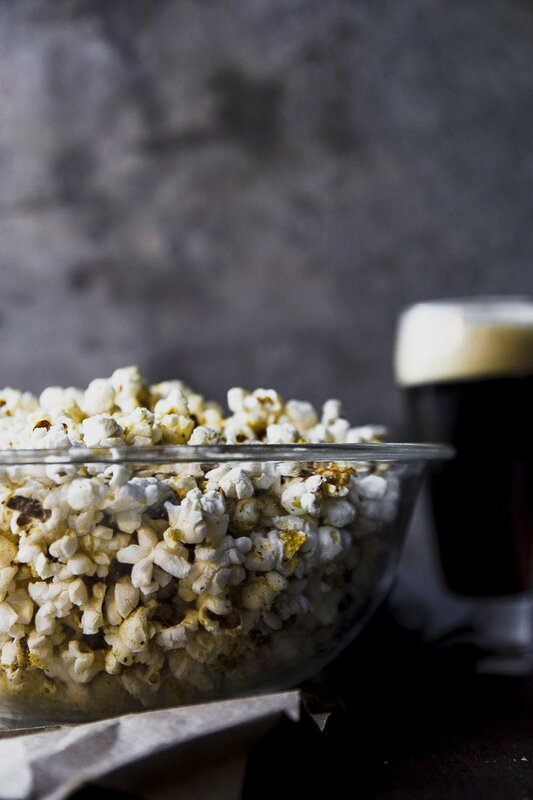 There are a lot of ‘perfect ‘ popcorn recipes out there. Alton Brown uses a bowl and foil, Food and Wine says the only way to go is enameled cast iron (which will not work if you use the Epicurious/Frank method listed below. Most others say any heavy bottomed stock pot will do. They are all right. And if your stove or pan differs you might end up with a few unpopped kernels or a few burnt kernels- throw those out! Then the rest will be perfect. If you want to make dinner for two, err I mean popcorn for a crowd, try this technique from Epicurious/Frank . Basically the popcorn recipe which mimic how the machines do it involves a large pot, adding more oil and more popcorn than you normally add, no preheating, and a deft hand to skim the popcorn off the top as the pan fills. (This is why this is house divided when it comes to this technique, I lack the skill or the practice or the will (not sure which) to not have several pieces of popcorn fly off the stove and onto the floor.) This recipe also calls for high heat and I end up burning the last few kernels every time- I blame the electric stove which is a fickle beast and so while the original technique calls for turning down to medium a few minutes after the first skim I do it just as the pot fills for the first time. If you want to just make enough popcorn for just you or if you don’t have a stock pot you can use a smaller pan, I’ve used a two quart sauce pan before (and yes I had to scoop, and yes, I got popcorn on the floor) but all the kernels popped and the popcorn that made it into the bowl was crisp and delicious . If you have more time these shiitake mushroom jo jos (gluten free) are another one of my go to snack foods. Just before the first scoop the first scoop or about 2-3 minutes in lower the heat to medium low and if not removing the lid to scoop then set slightly ajar so that steam can escape. After the scoop or just after lowering the heat give the pan a good shake. As the sound of popping noticeably slows take the pan off the heat. Put the popcorn in the bowl in 3-4 layers, sprinkling the seasoning between each layer.